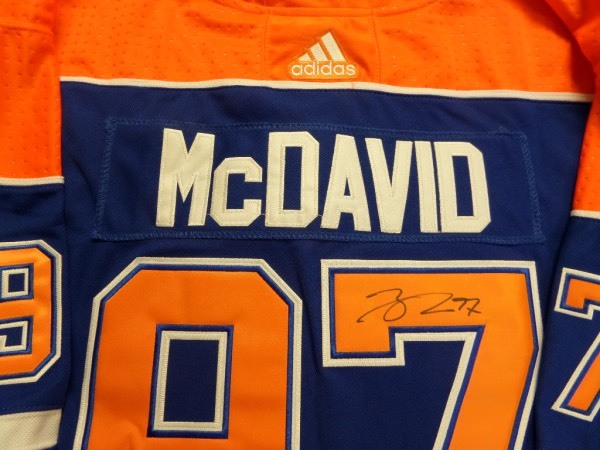 Coach's Corner - Connor McDavid #97 autographed/guaranteed Oilers jersey! Go Back to Lot List Connor McDavid #97 autographed/guaranteed Oilers jersey! This mint blue authentic Edmonton Oilers jersey has embroidered everything and is blue with orange and white trim. It comes signed on the back numbers wonderfully by this top draft pick and young megastar and best player in the game in black sharpie with his #97 included. Retail is already into the low thousands from this stud and probably rising! NICE. Once they build a team around him they gonna win! !